Innovision (18.03.2016) - Auspicious Monkey postage label. Black imprint, vending machine number 076. Mint ATM domestic mail (NT$5). Innovision (18.03.2016) - Auspicious Monkey postage label. Black imprint, vending machine number 123. Mint ATM domestic mail (NT$5). Innovision (18.03.2016) - Auspicious Monkey postage label. Black imprint, vending machine number 076. Ten mint ATMs (NT$ 1 to NT$ 10). Innovision (18.03.2016) - Auspicious Monkey postage label. Black imprint, vending machine number 138. Pictorial first day cover, domestic mail (NT$ 5). Pictorial postmark A.
Innovision (18.03.2016) - Auspicious Monkey postage label. Black imprint, vending machine number 138. First day cover, domestic mail (NT$ 5). Pictorial postmark A.
Innovision (18.03.2016) - Auspicious Monkey postage label. Black imprint, vending machine number 138. Pictorial first day cover, domestic mail (NT$ 5). Pictorial postmark B.
Innovision (18.03.2016) - Auspicious Monkey postage label. Black imprint, vending machine number 138. First day cover, domestic mail (NT$ 5). Pictorial postmark B.
Innovision (18.03.2016) - Auspicious Monkey postage label. Black imprint, vending machine number 138. Pictorial first day cover, domestic mail (NT$ 5). Pictorial postmark C.
Innovision (18.03.2016) - Auspicious Monkey postage label. Black imprint, vending machine number 138. First day cover, domestic mail (NT$ 5). Pictorial postmark C.
Innovision (18.03.2016) - Auspicious Monkey postage label. Black imprint, vending machine number 105. First day cover mailed to Spain (NT$ 17). Innovision (18.03.2016) - Auspicious Monkey postage label. Black imprint, vending machine number 138. First day cover mailed to Spain (NT$ 17). Date postmark. Innovision (18.03.2016) - Auspicious Monkey postage label. BLACK imprint, vending machine number 105. Commemorative folder including one mint 4-values set, international mail (NT$ 9-13-15-17), plus two topical stamps and a souvenir sheet 'Year of the Monkey', plus one SPECIMEN label. Innovision (18.03.2016) - Auspicious Monkey postage label. Black imprint, vending machine number 138. 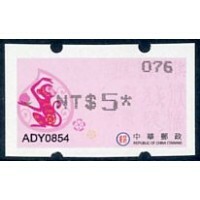 Maximum card with ATM (NT$5). First day pictorial postmark A.
Innovision (18.03.2016) - Auspicious Monkey postage label. Black imprint, vending machine number 138. Maximum card with ATM (NT$5). First day pictorial postmark C.
Innovision (18.03.2016) - Auspicious Monkey postage label. Black imprint, vending machine number 138. Set of three maximum cards with ATM (3 x NT$5). With the three different first day pictorial postmarks. Innovision (18.03.2016) - Auspicious Monkey postage label. Black imprint, vending machine number 105. Mint set 4 values, international mail (NT$ 9 - 13 - 15 - 17). Innovision (18.03.2016) - Auspicious Monkey postage label. Black imprint, vending machine number 123. Mint set 4 values, international mail (NT$ 9 - 13 - 15 - 17). Innovision (18.03.2016) - Auspicious Monkey postage label. BLACK imprint, vending machine number 076. Mint set 8 values, domestic and international mail (NT$ 5 - 12 - 25 - 32 + NT$ 9 - 13 - 15 - 17). Innovision (18.03.2016) - Auspicious Monkey postage label. BLUE imprint, vending machine number 114. Mint ATM, several values available. Innovision (29.12.2016) - Auspicious Monkey postage label. Machine number 083 - Special imprint in GREEN color. Mint ATM, different values available. Innovision (29.12.2016) - Auspicious Monkey postage label. Machine number 112 - Special imprint in GREEN color. Mint ATM, different values available.